Arthur Blank and his business partner Bernie Marcus did a pretty good job of figuring out how to make money, founding Atlanta-based The Home Depot and turning it into a global operation that revolutionized home improvement retailing and made them both billionaires. And Blank has done just fine as owner of an NFL franchise. But when it came to giving money away, he needed a little help from the son of another retail icon. Since its founding in 1995, the Arthur M. Blank Family Foundation has given more than $300 million in grants to a wide variety of causes. His goal, he says, is that 95 percent of his estate will be recycled back through the foundation. “We have a long way to go,” he says. “The estate is very substantial, thanks to The Home Depot and thanks to the NFL.” Forbes estimated his wealth at $1.6 billion in 2013. 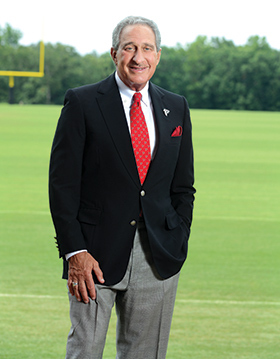 Blank, who began a new career as owner of the Atlanta Falcons after he stepped down as The Home Depot CEO, is one of two new Georgia Trustees for 2014, sharing honors with Billy Payne, the man who brought the Olympics to Atlanta. Blank set up his foundation to complement his family’s enthusiasms. “Each of my adult children have areas of interest they feel very strongly about. My oldest daughter cares a great deal about public education; my middle daughter, about the environment and wildlife conservation. My oldest son, about the arts. And I care a great deal about all of those, also about youth and self-esteem issues and confidence issues. Grantees for 2013 include a variety of organizations large and small: $150,000 to the United Way of Metropolitan Atlanta for operating support of GEEARS, a statewide program focused on helping children prepare for school; $85,000 to the Truly Living Well Center for Natural Urban Agriculture for the Elm Street Community Garden in the English Avenue neighborhood; and $500 each to several high schools and athletic programs for sports equipment. Was there an “Aha!” moment when Blank realized he could be a benefactor on such a large scale? Blank says it’s a “great joy” for him to see his adult children so immersed in and enthusiastic about the foundation. His younger children (a 16-year-old son and 12-year-old twins) are involved as well, getting some orientation into the practice of philanthropy. Atlanta has been a good fit for Blank and his ambitions. He recognized it early on – and the city recognized what it had in Blank, as a CEO and then as an NFL owner. He served as chairman of the Metro Atlanta Chamber, among other board memberships. The city power structure’s signature blend of business acumen and civic involvement that served Atlanta so well from the tumultuous 1960s on is very much to Blank’s liking, of course; but beyond that, the openness of the city, the genteel but palpable can-do attitude and the willingness to offer a seat at the table were important to him. There’s no probationary period for a committed newcomer: Jump right in. Blank grew up in New York – in Queens, the son of a pharmacist. After college, he worked as an accountant and eventually ended up as a VP of finance at Handy Dan Home Improvement Centers, where Marcus was CEO. The two found themselves on the losing side of an internal power struggle and were fired in 1978, the same year they founded The Home Depot and began to make retailing history from an Atlanta home base. The new Falcons stadium that will be built in downtown Atlanta to replace the 22-year-old Georgia Dome is a prime example of that kind of collaboration. “If you look at the stakeholders – the state, the city, the city council, the community, English Avenue, Vine City, the Georgia World Congress Center and our fans, our sponsors, everybody with a stake in this,” he says, “one of the reasons doing the stadium was as complex as it was, [was] trying to please a lot of stakeholders, trying to find points of interest, common interests. We’ve been successful in doing that. On balance, the deal’s gone well. We’re happy to be in the position that we will break ground in April and start building. His interest, he says, does not stop at the stadium gates. He’s very clear on that. “We’ve taken it on as a challenge – individually, collectively, as a leadership team, our foundation, to make a difference in the west side of Atlanta. We take that commitment very seriously. The process, he says, is reminiscent of the way he and Marcus ran their retail operation. “At Home Depot, it was not our decisions, it was customers’. The customers were the ones who drove what should we carry where. We just responded to what the customers were telling us. In this case, our stadium design, layout, amenities, parking, connection to communities – all those things are responses to what our fans and sponsors are telling us are important to them. It’s hard not to contrast the process of securing a new football stadium for the Falcons with the Braves exit to Cobb County and a new stadium to be built there. Neither deal was without its critics, but the football stadium process, protracted as it was, involving drawn-out negotiations with two historic churches in the neighborhood, was more transparent than the hastily accomplished baseball stadium process, which was announced and approved by the Cobb County Commission in less than three weeks. There is a key difference in ownership, of course – the well-known hometown Falcons’ owner and the Colorado-based corporate owner of the Braves – Liberty Media. Blank believes his Atlanta credentials helped. No criticism of Liberty Media or the local folks who run the Braves, he says, but the NFL requires principal owners to have a strong individual, preferably local, identity as opposed to one that is corporate. The job description of an NFL franchise owner, of course, has undergone some changes. But is it fun, as all armchair quarterbacks assume? “Winning is a lot of fun,” Blank says. “I love the competition, love to win for our players and coaches and love to see it for our fans. The togetherness that takes place around wins is powerful. On the other hand, when you lose. …” He pauses. “This is a difficult year for us. It’s been hard emotionally because I carry a lot of it on my back. Blank is committed to what he sees as a vital connection between business and the community. Again, he references The Home Depot: “2001 was my last year as CEO of the company. We were recognized by The Wall Street Journal, in a nationwide poll, as being the most socially responsible company in America. That’s a great recognition, when you match that up with a 23-year record of sales that were [up] 46 percent that year, earnings up 49 percent, stock up 45 percent a year. Blank’s roster of heroes starts close to home.